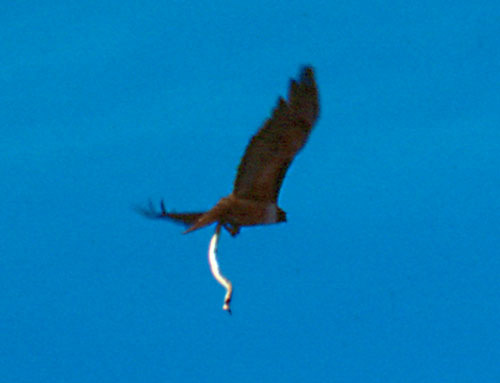 We decided to fly into Las Vegas and make a big loop through Arizona for this trip. I’m not sure if the airlines actually stock extra quantities of those mini booze bottles for flights from the East Coast to Vegas, but judging by the passenger’s temperaments as Vegas drew closer, they must. I tried to hook up the GPS to the laptop during the flight to find out where we were, but couldn’t get it to work! It was working last trip, so I figured we would have to spend some time upon arrival to figure out what went wrong. Arrived in Las Vegas, Nevada. We had reserved a Jeep Cherokee with Dollar Rent-A-Car, but found out they had none when we arrived. Ended up with a Dodge Durango instead – same price and it turned out to be pretty nice. The GPS receiver itself was working fine but it was no longer sending any data to the laptop. After playing with every conceivable option in the setup of the GPS and the laptop, we figured it had to be the cable. So we started looking for a Magellan GPS to Laptop cable. Well, it seems that GPS is not a high priority in Vegas. We went to Office Max, Office Depot, Wal-Mart, Sports Authority, Circuit City, Best Buy, another electronics store, a camping store, and we called several other stores. Not a single place even carried GPS receivers, let alone the cable that we needed. 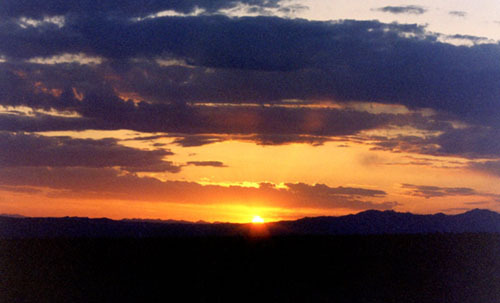 At about 5pm we resolved to drive off to Wickenburg, Arizona and to try again for GPS parts in Phoenix tomorrow. The trip into Arizona was without incident and we arrived at the Owl Tree Inn bed & breakfast, our home for the next six nights. Today started with a trip into Phoenix to find a GPS cable. The first stop, a Staples, actually had one! I hooked it up, went outside and still nothing. The staff there even let me try a different GPS receiver and cable without having to buy it first. After a lot of trial and error, I concluded it must be something in the laptop itself. A trip to the CompUSA next door and I bought a USB-to-Serial converter (they wouldn’t let me try it unless I bought it first – one point for Staples, zero for CompUSA). This worked even with the original GPS and cable, so we were all set. The conclusion is that the serial port on my laptop had died. 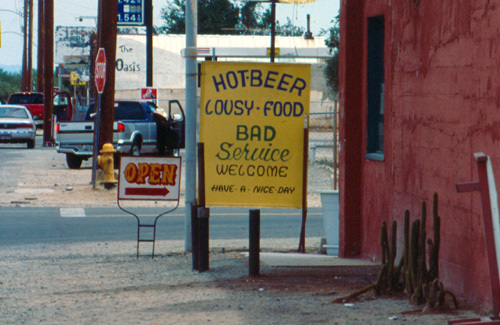 After lunch at a nearby Fuddruckers, we decided to head back to the Wickenburg area – most of the day was already spent. 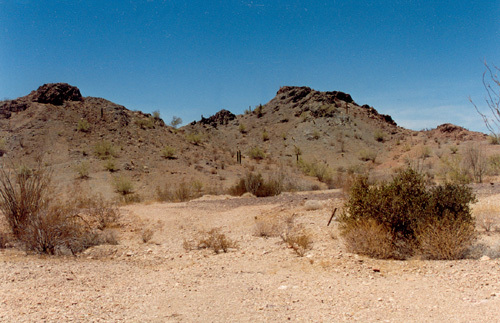 We did have info on one spot right near Wickenburg though, a hill of Rhyolite with small Quartz geodes. We did find a few 1-3″ geodes and a couple larger, but with fairly small cavities. This morning we started out by driving north about 20 miles on US-93 to the turn-off for Date Creek Ranch. One of the mineral guides for this area cited clear Quartz crystals all over the hills in this area. Though we looked around and dug a bit for a couple hours, all we found was a small milky Quartz Leaverite – A Leaverite being a mineral specimen that would best complement your collection by leaving it right where it is. After this, we went back towards Wickenburg and took AZ-89 through the town of Congress towards the old ghost towns and mines at the foot of Rich Hill. The Gold here was discovered in the early 1860’s and was so plentiful that many people got rich just walking around picking up the Gold lying on the surface – some nuggets the size of potatoes. This, in fact, is where the name Rich Hill comes from. Over $500,000 ($14 million in today’s dollars) was collected from the surface and stream gravels in the first five years. 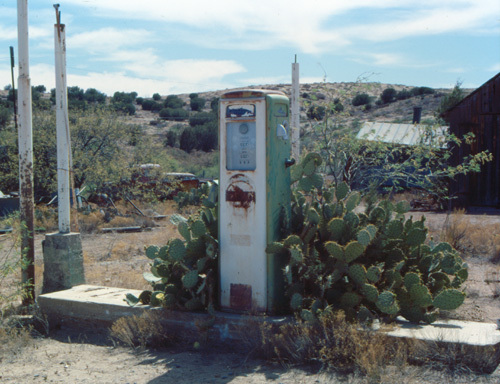 At the base of Rich Hill are the three ghost towns of Weaver, Stanton and Octave. Follow the links to read all about them. About 6 months prior to our visit someone found a nugget weighing in at almost 2 pounds in this area, so we spent some time in and near the washes with a gold detector. The good news is that we found something at every spot the detector went off. The bad news is that they were all bullets or small chunks of wire. 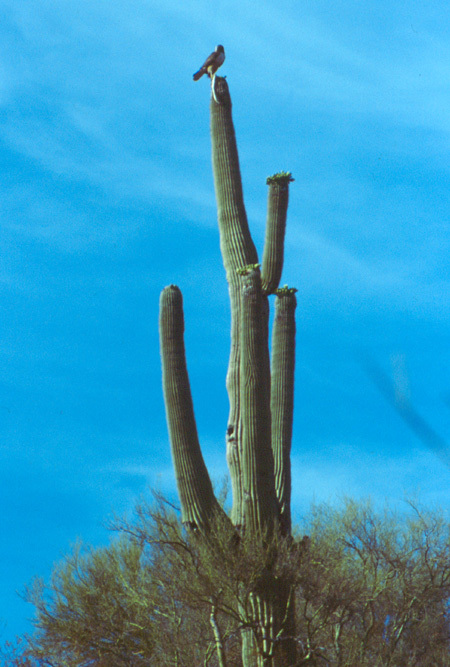 But pretty close – I think that’s a Prickly Pear on the flag, and this was a Saguaro. Couldn’t get much closer without disturbing him, but we did get a couple shots after he took to the air. 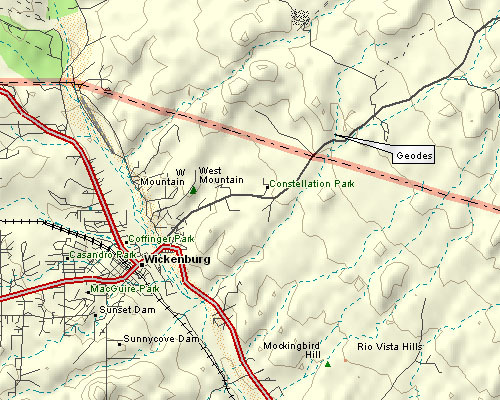 We then headed west from Wickenburg on US-60 to the town of Wenden. If you’re looking for cold beer, great food and good service, what can I say? Maybe you should stay out of Wenden. 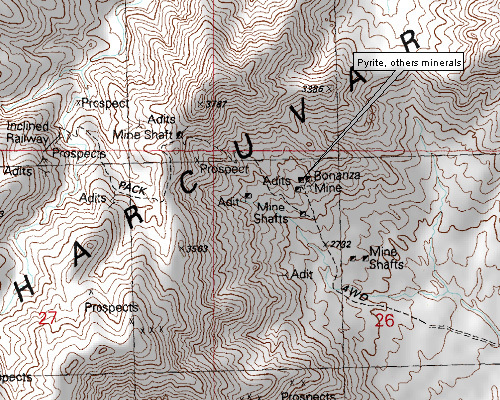 Our first stop was the Bonanza Mine, about 9 miles north of Wenden in the Harcuvar Mountains. The road got pretty rough over the last mile or so, so we didn’t make it as far as the abandoned inclined railroad marked on the topo map. Too bad, sounds like something cool to check out. The mine itself had some pretty good dumps with both Iron and Copper minerals present. 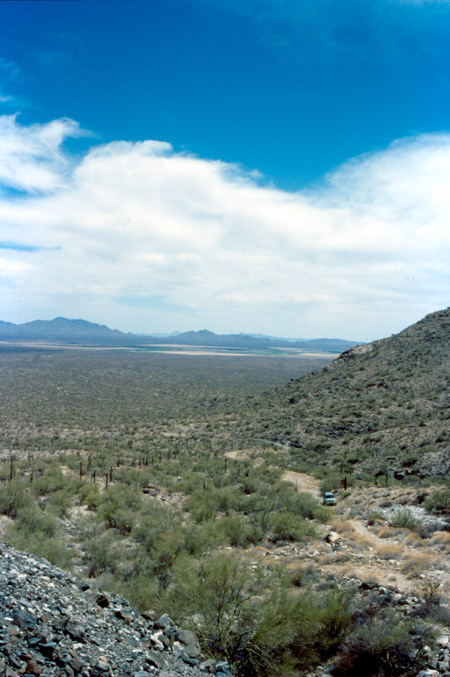 The view from the mine, looking back towards McMullen Valley, Wenden and the Harquahala Mountains beyond. Those mountains were our next destination. 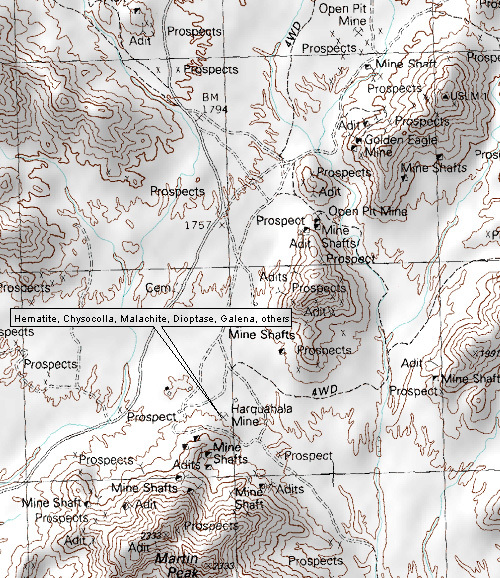 Specifically, the Harquahala mining district and ghost town. 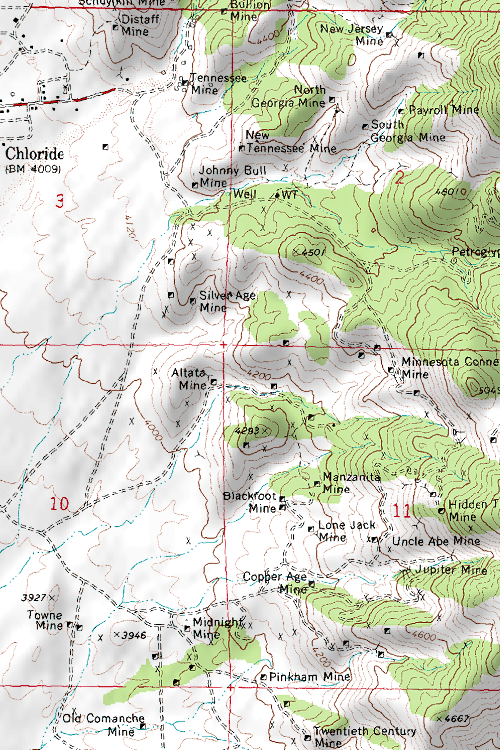 As you can see from the map, there are enough mines and dumps here to explore for several weeks. We only spent the afternoon, so failed to find most of the long list of minerals found here. A good candidate for a future trip! 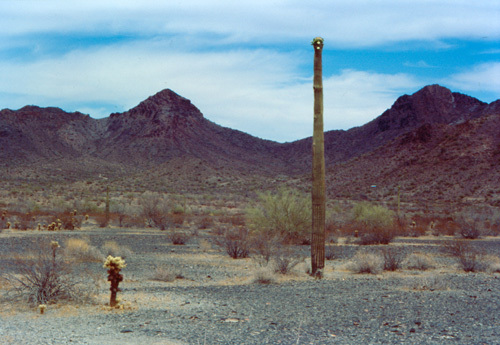 This is roughly the spot where the gold boom town of Harquahala was once located. There are still a few buildings, outside this photo. 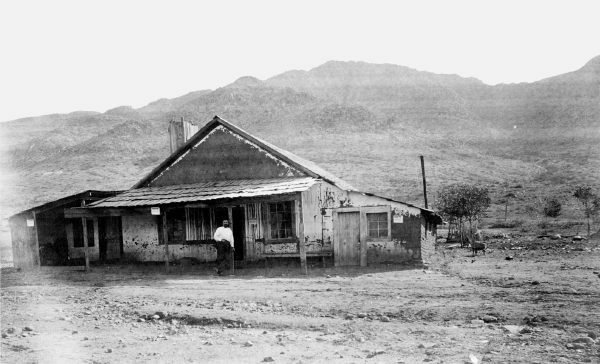 The town arose shortly after the discovery of gold in 1888, and continued for a long time by western ghost town standards – the last residents departed in 1932. There was a mill located here that cast the gold ore into large ingots weighting 400 pounds; much larger than the ingots cast at other mills (a 400 lb bar would be about 6″ square and 18″ long). Stories tell that the ingots were so heavy, they occasionally broke through the floor of the wagons carrying them, sometimes unknown to the driver. Finding a single lost ingot at today’s gold prices would net just over $10.8 million. 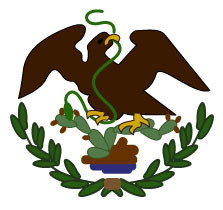 We have sometimes been unable to locate certain rockhounding sites. 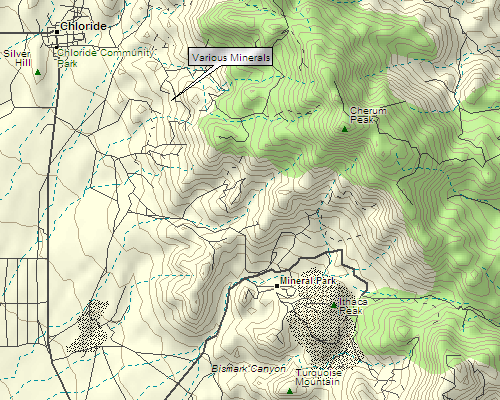 Old mines and other locations for which we have a lat/long are trivial with the GPS and topographic maps, but sometime we only have “go about 2 miles down the dirt road and make a left at the big bush…” or something similar. Other times, we have found the site but failed to turn up any of the minerals supposed to be present. Today, however, we found a new problem that we had not experienced previously. We started out heading north from Wickenburg and took AZ-89 towards Congress. 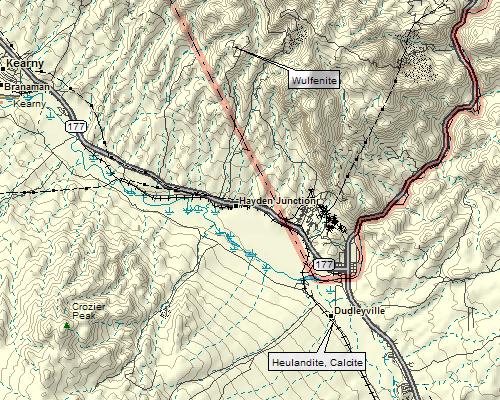 Then up the long grade through the Weaver Mountains and Peeples Valley to Kirkland Junction. Then AZ-96 to Kirkland and north on Iron Springs road. Our first stop was to be an old copper mining area near Iron Springs. However, when we got to the turnoff, the road was closed due to forest fires. 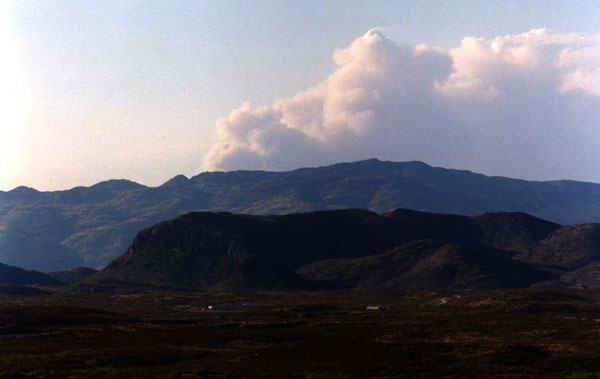 Not the risk of forest fires, but actual fires that were currently burning. 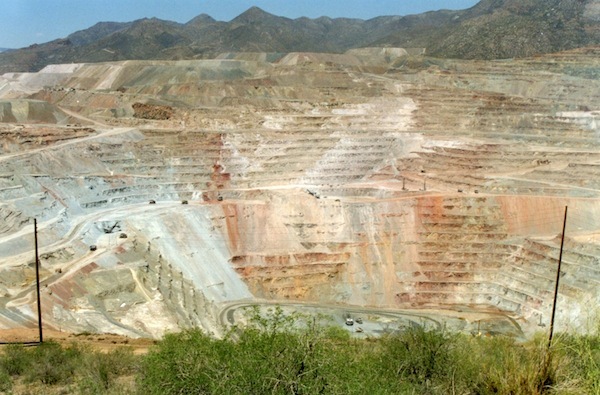 Not to be deterred, we pressed on to Prescott and our second location, a copper mining district in the Sierra Prieta Mountains just southwest of the town. Again, closed due to forest fires. This time, at the point where the road was closed we could actually smell the smoke. So we backtracked for a ways, took AZ-69 out of Prescott, highway 169 over to I-17, and north for a bit to the town of Camp Verde. Finally, paydirt. Our goal here was an old salt mine that is covered with saline and calcium minerals. The white areas here are almost pure salt where we found some very nice Glauberite crystals. On the way back south on I-17, we took the Crown King road exit. This road goes up through the Bradshaw Mountains and back to where we started, passing through three good size mining districts along the way. And guess what? The road was closed due to forest fires. We did get as far as the ghost town of Cordes and one of the mine dumps east of Cleator before the road closure. Luckily we didn’t need any gas because the only station in Cordes looked pretty closed. This morning we headed halfway across Arizona to Quartzsite, then south on US-95 towards Yuma. We turned east on Castle Dome Mine Road, about 20 miles north of Yuma. There is a small museum here near where the old mill for the Castle Dome mine was located, but a few miles past that is the Hull Mine. This is a small hill with several adits and at least one shaft. It is very solid rock, the main adit is very wide and flat, and there is good ventialtion from the shaft and other adits, so this is one mine we don’t have a problem entering. 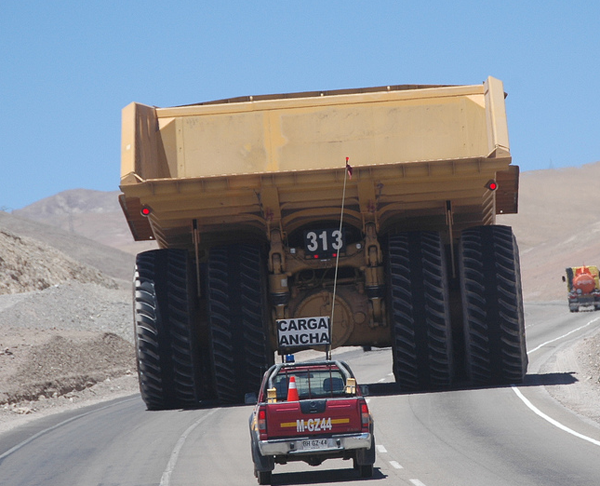 The dumps and the mine itself contain fluorescent Calcite, Galena, Fluorite and Wulfenite. 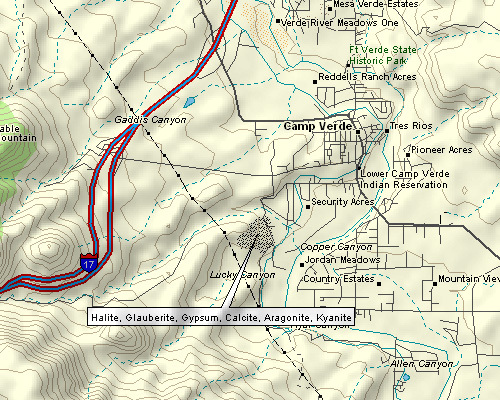 We heading into Yuma for lunch, then across the Colorado (which is barely a creek at this point) and into California. The first exit off I-8 in California is county highway S34 / Ogilvy Road, which goes north all the way to CA-78 and Palo Verde. About 13 miles from I-8 is the turnoff for Indian Pass road. Just a few miles down the road, blue Dunmortierite can be found scattered around on the hills. 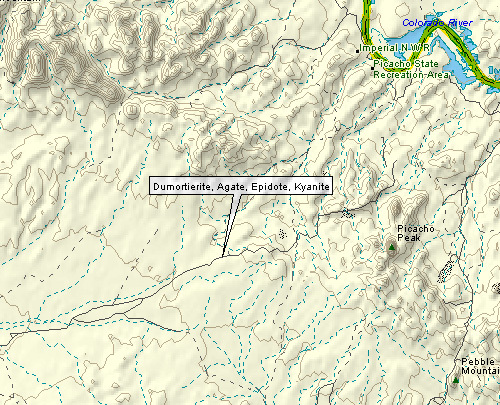 One source also lists Kyanite at this location, but since Kyanite is about the same color and appearance as Dunmortierite, we think that’s probably a mistake. 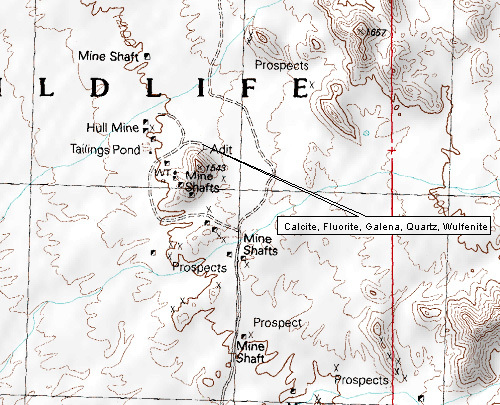 Finally, we continued north to Palo Verde and turned off to the Opal Hill Mine. This site is famous for it’s fire opals, and while we did collect several pieces, we haven’t done enough cleaning and examining to see if we got anything good. Our last day in Wickenberg, we mostly took it easy and spent some time better exploring the ghost towns of Weaver, Stanton and Octave. Today we left Wickenburg and headed south for the Rancho Milagro B&B just outside Elgin. Along the way we stopped at the Ray Mine on AZ-177 south of Superior. Just south of the Ray Mine, we turned off at Hayden and went about 5 miles northwest to the Seventy-Nine Mine. 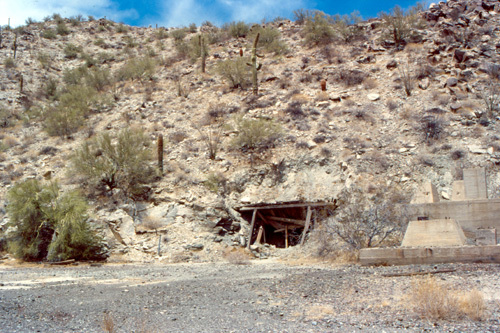 This mine operated off and on from 1879 through 1951 and the primary ores were Lead, Zinc, Copper, Silver, Gold, Molybdenum, Tin, Vanadium, and Iron. It also operated for mineral specimens up until the 1990’s. We searched the dumps and surface area and found some good Wulfenite samples and several Copper minerals. A little further south from Hayden on AZ-77 is the town of Dudleyville where we found some big chunks of Heulandite with Calcite and Celadonite at the railroad cut just west of town. Further south we began to see more forest fires like those that stopped us a few days ago. 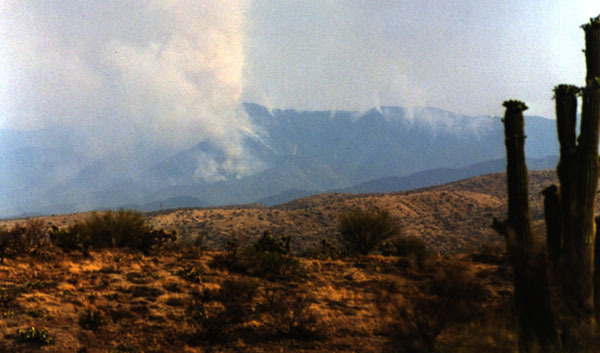 These were burning in the Santa Catalina mountains north of Tucson. 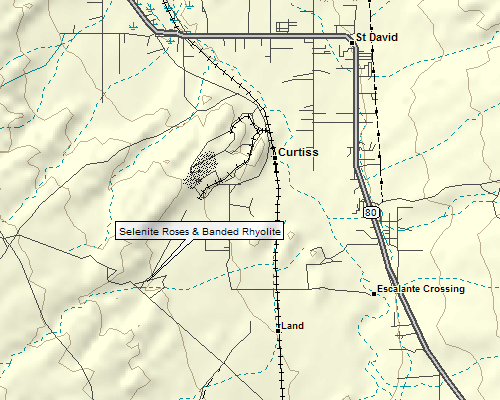 Today we headed northeast from Elgin to a Selenite locality just outside of St. David. 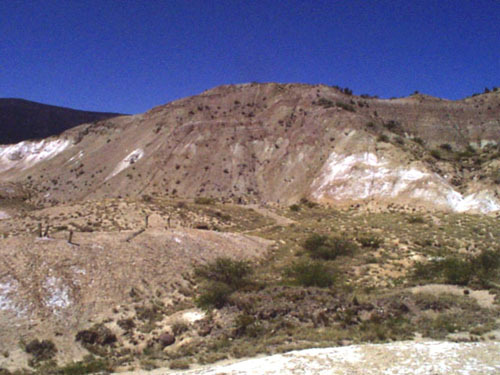 The site consists of a long bank of soft dirt and Rhyolite in which both Selenite crystals and Gypsum Roses can be found. The latter are found in slightly moist dirt and are extremely delicate until they are completely dried out. 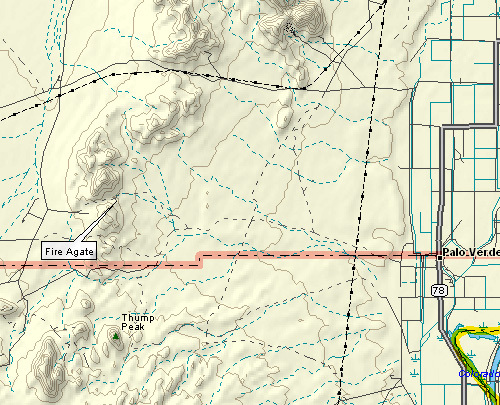 Next, we headed back through Sonoita and south on AZ-82 towards Nogales. 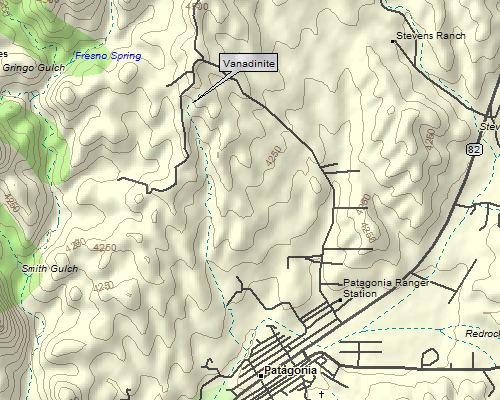 Along the way is the nice little town of Patagonia where we turned north to a site with Vanadanite. The Vanadanite crystals are quite small, but easily found encrusting most of the rocks in the area. After lunch in Nogales (at a McDonalds within spitting distance of the Mexican border) we headed for our last rockhounding stop for the day. 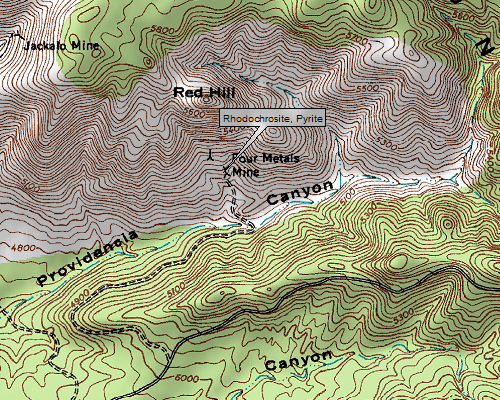 The Camp Washington and Duquesne area is thick with both old and currently operating mines. 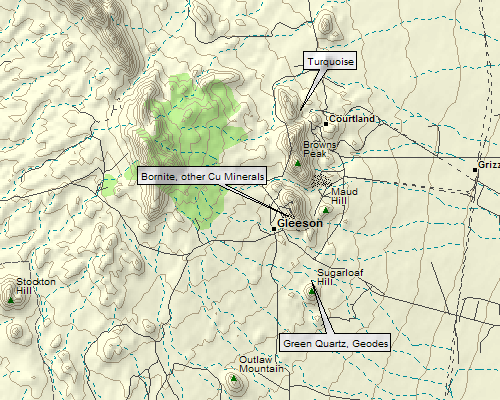 However, our goal was the Four Metals Mine, well short of the Camp Washington area, but just off of Duquesne Road, which is about 4 miles north of Nogales. We were able to find some decent pieces of Rhodochrosite and Chalcopyrite, and some Molybdenite. That night back at the B&B in Elgin we were serenaded by Coyotes and peeking out at about 3AM we saw 5 or 6 of them not more than 50 feet from our front door. This morning we travelled east from Elgin and made a tourist stop at Tombstone. I have to say, Boot Hill Cemetary is a real disappointment – a small area with headstone markers that they charge addmission to. Except all the markers are recently made with stenciled paint and not necassarily in the right places. A real tourist trap ripoff. 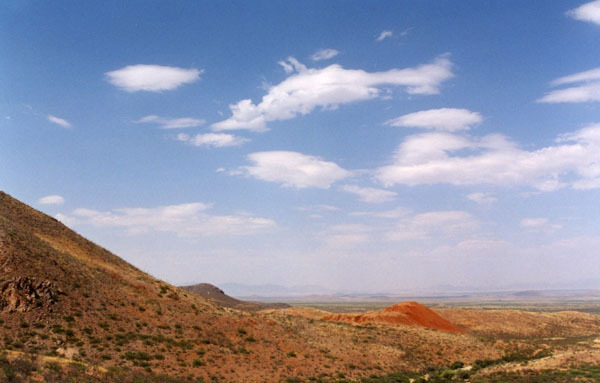 15 miles east of Tombstone is the Turquoise mining district in the Dragoon mountains around the town sites of Gleeson and Courtland. 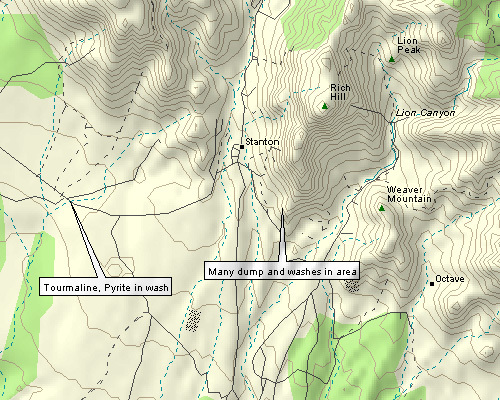 We found mostly Calcite and Quartz pieces on the dumps here, some with copper minerals. We left Elgin this morning and drove north towards Kingman, then west on the old Route 66. 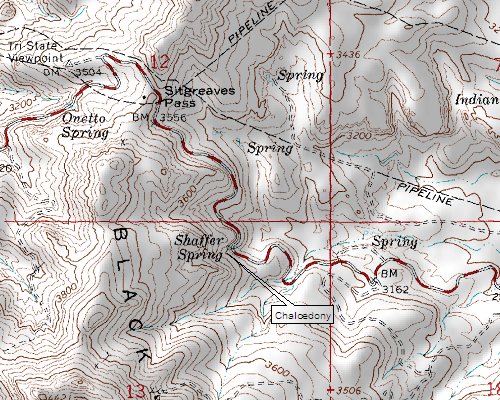 We stopped off at Shaffer Spring, just before the summit of the Black Mountains at Sitegreaves Pass. We found some bubbly Chalcedony here that fluoresces a nice bright green. Just beyond the pass, we stopped off at the Gold Road Mine, which offer tours whenever the gold prices are too low to operate the mine. Fortunately for us (but not the mine owners) we were able to go on the tour that actually goes under Route 66. This mine dates back to 1900, so that is over 100 years of nearly continuous gold production. 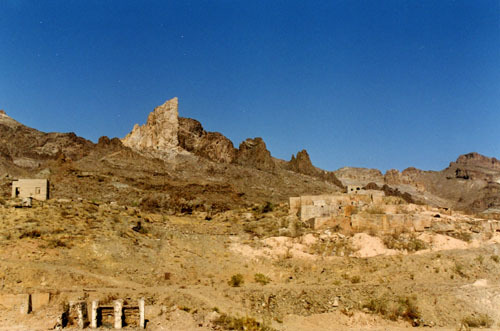 This was one of the many mines in the area that led to the founding of Oatman (originally named “Vivian”). 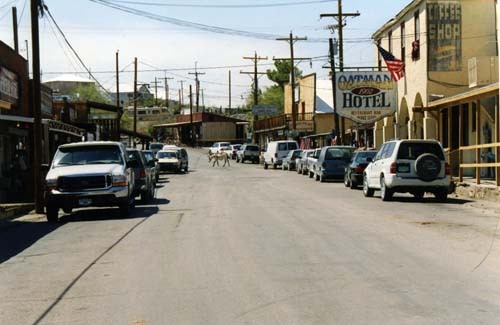 The population of Oatman peaked at 20,000 in 1930. Today, just under 200 people still live there. 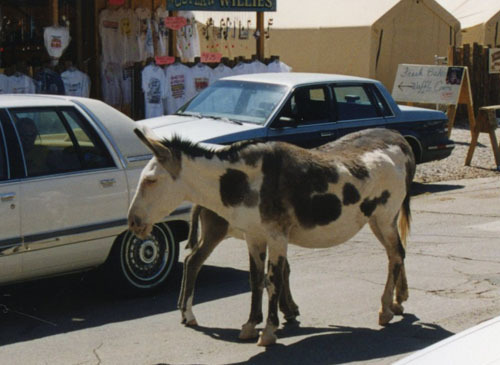 The descendants of miner’s burros still live throughout the area, and at any one time 10 or so make Oatman itself their home. Just beyond the town are the remains of the Tom Reed Mine and mill. This operated from 1910 until most gold mines were closed during the Second World War. 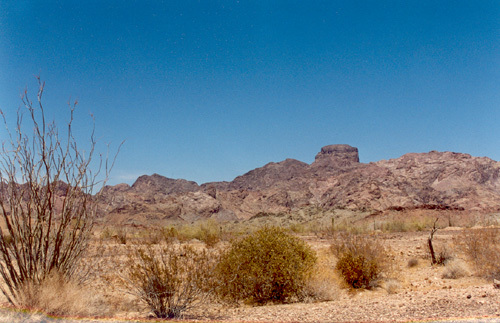 From Oatman, we continued across the Colorado River and stayed at one of the hotel/casinos in Laughlin. Today we travelled from Laughlin back into Arizona and explored the mine-rich area near the towns of Chloride and Mineral Park. 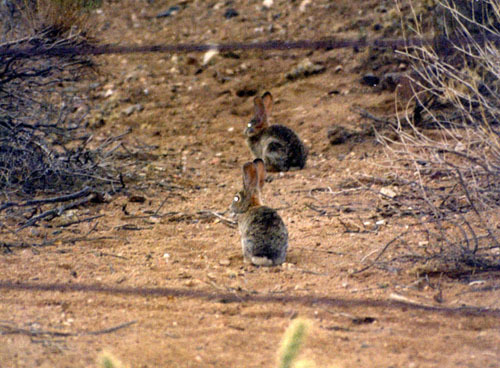 Coming back through Chloride at dusk hundreds of wild rabbits came out! Not sure if they hang out here because someone feeds them or what, but they were everywhere. That was it for this trip. We drove up to Vegas and flew home the next day.